This article is about the town in England. For other uses, see Tipton (disambiguation). 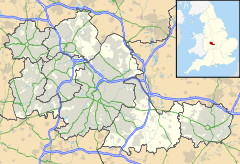 Tipton is a town northwest of Birmingham in the borough of Sandwell, West Midlands, England. Historically within Staffordshire, with a population of around 38,777 at the 2011 UK Census. It is a part of the Black Country, located about halfway between Birmingham and Wolverhampton, in the West Midlands conurbation. Most of the town is now in the borough of Sandwell, with the western fringes – including the Foxyards estate and the site of the former Tipton Town Hall – in the borough of Dudley. Tipton was an urban district until 1938, when it became a municipal borough. 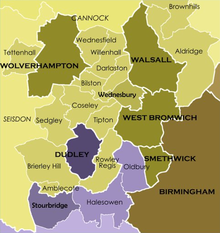 Much of the Borough of Tipton was transferred into West Bromwich County Borough in 1966, but parts of the old borough were absorbed into an expanded Dudley borough and the newly created County Borough of Warley. Along with the rest of West Bromwich and Warley, Tipton was moved into the Sandwell Metropolitan Borough in 1974 and remains within this local authority to this day. Tipton was once one of the most heavily industrialised towns in the Black Country, with thousands of people employed in the town's industries. Its factories began closing in the 1970s and it has gradually become a commuter town, home largely to people working in other parts of the region. The town of Tipton was recorded asTibintone in the Domesday Book, meaning Tibba's estate. The present spelling of Tipton derives from the 16th century. Until the 18th century, Tipton was a collection of small hamlets. Industrial growth started in the town when ironstone and coal were discovered in the 1770s. A number of canals were built through the town and later railways, which greatly accelerated its industrialisation. James Watt built his first steam engine  in or very near Tipton in the 1770s, which was used to pump water from the mines. In 1780, James Keir and Alexander Blair set up a chemical works there, making alkali and soap on a large scale. The 1801 census records 834 houses with 872 families living in Tipton: 46 houses were stated as being empty. An adult population of 4,280 is recorded with males numbered at 2,218 and slightly fewer females at 2,062. Iron making and mining were the main employment for the population. Trades and manufacturing provided work for 1,740 people and other jobs totalled 2,484. Between Tipton and Dudley there were a few farms listed, which gave employment to 56 people. Expansion in the iron and coal industries led to the population of Tipton expanding rapidly through the 19th century, going from 4,000 at the beginning of the century to 30,000 at the end. Tipton gained a reputation as being "the quintessence of the Black Country" because chimneys of local factories belched heavy pollution into the air, whilst houses and factories were built side by side. Most of the traditional industries which once dominated the town have since disappeared. The Black Country Living Museum in nearby Dudley re-creates life in the early 20th century Black Country, in original buildings which have been rebuilt and furnished, many of them being transported from – or based on – sites originally located in Tipton. There is a residential canal basin at the museum, reflecting Tipton's former status in popular local culture as the Venice of the Midlands. Some of the town's canals were infilled during the 1960s and 1970s. The towpaths of the remaining canals are a today cycling, wildlife and leisure facility. The landscape of Tipton began to change further from the late 1920s when new housing estates were built by the town's council, in response to the growing need to replace slum housing. Among the first council estates to be built were the Shrubbery Estate at Tipton Green, the Tibbington Estate at Princes End, the Moat Farm Estate at Ocker Hill (which earned the nickname "Lost City" due to its isolated location) and the Cotterill's Farm Estate between Princes End and Great Bridge. Private houses were also built on smaller developments around the same time. The "Lost City" was integrated with the rest of Tipton as further housing developments sprang up around it. During the Second World War (1939–1945), there were a number of air raids on the town. On 19 November 1940, three people were killed by a Luftwaffe bomb which was dropped in Bloomfield Road and destroyed several buildings including the Star public house; it was rebuilt after the war but demolished in 1996. Just before Christmas in 1940, an anti-aircraft shell fired from the hills at Rowley Regis fell down the chimney of the Boat Inn, Dudley Road East, Tividale; fatally injuring 12 people at a wedding reception (including the bride, while the groom lost both legs) as well as the resident of an adjacent house. On 17 May 1941, six people died in an air raid in New Road, Great Bridge. Tipton Tavern and New Road Methodist Church were destroyed and a number of nearby houses were damaged. Tipton Tavern landlord Roger Preece was trapped in the rubble but survived with minor injuries. Tipton Tavern was rebuilt in the 1950s and became the Hallbridge Arms during the 1990s and more recently became the Pearl Girl, the world's first licensed pearl bar. It closed in 2016 and has since been converted into a day nursery for young children. The last major council housing development by Tipton council was the Glebefields Estate between Princes End and Ocker Hill, built during the first half of the 1960s. A stretch of the Wednesbury Oak Loop Canal was filled in to make way for it. The last major private housing development to be built in the Municipal Borough of Tipton was the Foxyards Estate, on land straddling the borders with Dudley and Coseley, in the mid 1960s. Until 1966, the town had its own council. The urban district council of Tipton was formed in 1894, then received County Borough status in 1938. The headquarters were originally based in a 19th-century building on Owen Street until 1935 when it relocated to the former Bean offices site on Sedgley Road West, straddling the border with Coseley. The council remained at that site for the next 31 years, until the dissolution of the borough council in April 1966. The building was later taken over by Dudley College, who retained it until 1993. It has since been occupied by businesses and training scheme providers. The bulk of the Tipton borough was absorbed into an expanded West Bromwich borough, although a fragment of the town near the border with Coseley (including the former council offices and the bulk of the new Foxyards housing estate) was absorbed into Dudley and most of the Tividale area became part of the new County Borough of Warley. In this reorganisation, the township of Tipton was expanded around Princes End to take over a section of the former Coseley urban district. Since 1974, Tipton has been split between the Metropolitan Borough of Sandwell, which was created by a merger of the former West Bromwich and Warley boroughs, and the neighbouring Metropolitan Borough of Dudley. By the end of the 1970s, most of the housing in Tipton built before 1890 had been demolished. Owen Street, the town's main shopping area, was redeveloped between 1979 and 1982, with a reduced number of shop units as well as new low-rise council houses and flats. Tipton's first gasworks was opened in 1958 and redeveloped as a state-of-the-art Naphta Gas plant by 1965, but owing to the emergence of North Sea gas, the gasworks closed in 1975 and stood empty for a decade before demolition. The site of the gas plant was redeveloped as the Standbridge Park housing estates in the 1990s. In 1956, one of Britain's first comprehensive schools, Tividale Comprehensive School, was opened in Tipton near the border with Oldbury, in the area which became part of Warley a decade later and was not included in the modern Tipton DY4 postal district. Tipton has two railway stations, the main railway station at Owen Street and another station at Dudley Port. There were several other stations in the town on three different railway lines, but these were gradually closed between 1916 and 1964 as passenger trains were phased out on these lines. The Dudley-Wolverhampton railway line, which straddled Tipton's border with Coseley, closed in 1968. The Princes End Branch Line, which was only two miles long, closed in 1981. The South Staffordshire Line through Tipton, which led to Walsall northwards and Dudley southwards, closed in 1993 but is scheduled to re-open at some point in the future to goods trains and light passenger trains. Most of the archive collection for Tipton is held at Sandwell Community History and Archives Service, although some items have been retained by the town's library. Tipton was one of the key towns in the Industrial Revolution of the 19th century. Even during the 18th century it had established its first key industries. This included the world's first successful steam pumping engine, which was erected at Conygre Coalworks in 1712 by industrialist Thomas Newcomen. A full-size replica of the engine now exists at the Black Country Living Museum just over Tipton's borders in Dudley. In 1800, Tipton was a predominantly rural area, with a few coal mines and some 4,000 residents. Mass building of factories and digging of coal mines then took place, and resulted in Tipton becoming a heavily built-up and industrialised area with more than 30,000 residents by the end of the 19th century. The town's population grew further in the 20th century after new housing developments, mostly by the local council but with a significant number in the private sector. Local industry also expanded further during this time. In 1840, the Batson family established a lubricant blending plant to serve the local industries at the junction of High Street and Dudley Road. The site is still operational today, owned by German refiner H&R AG, although the original buildings have long since been replaced. Coal mining had disappeared from Tipton by the mid-20th century, and the town lost a large percentage of its factories during the recessions of the 1970s and 1980s, which contributed to a rise in unemployment and poverty in the Tipton, while living conditions continued to improve. Bean Cars, a company that manufactured cars and lorry engines and other vehicle parts, had a factory in Tipton  Further industrial sites have been abandoned since the 1970s, paving the way for mass private house building on the land. The town's naphtha gas plant opened in 1965 but closed just 10 years later, unable to compete with natural gas from the North Sea. The gasworks stood abandoned for about a decade afterwards, when it was finally demolished. Standeridge Park housing estate was built on its site during the 1990s. By the late 2000s, most of the town's large factories had closed. Tipton gains its name from the Anglo-Saxon name 'Tibba' followed by 'Tun', the Old English word for farm or settlement. It is written as 'Tibintone' in the Domesday Book. The M5 motorway between the West Midlands and the West Country and its junction with the M6 motorway passes through the town. The M5 runs along the eastern region passing over canals and railways. M5 Junction 1 is accessible at West Bromwich using the A41 road Soho Road. M5 Junction 2 is accessible at Oldbury on the A4123 Wolverhampton Road (Harborne to Wolverhampton) at Birchley Island. The M5 also enables access to other motorways. Tipton has direct bus links with the towns of Dudley, Walsall, Birmingham, Wolverhampton, Sedgley, Coseley, West Bromwich, Oldbury, Smethwick, Bilston, Wednesbury and Darlaston, though not all buses reach the town centre. Tipton has a direct rail link with the areas of Wolverhampton, Birmingham, Coventry and from 14 December 2008 this now links to Walsall. There are two railway stations - Tipton in the town centre and Dudley Port. Both are on the electrified line from Birmingham New Street to Wolverhampton which is a section of the West Coast Main Line. Closed lines include that from Walsall to Stourbridge, closed to all traffic in 1993 after some 150 years in use. This line had served stations at Dudley Port Lower Level and Great Bridge North, but both were closed in 1964 by the Beeching Axe. The line is set to re-open around 2023, with the lines shared between goods trains and the Midland Metro. In October 2015, it was announced that due to high transport funding for the West Midlands, the Stourbridge to Walsall line could re-open as a Network Rail operated line served by West Midlands franchise services and the delivery date was 2018-2020. This means that Dudley Port Low Level would re-open on the line. The preceding station will be Dudley Town railway station and the succeeding will be either Great Bridge or Wednesbury Town railway station. The line between Great Bridge and Swan Village in nearby West Bromwich was closed in 1968 under the Beeching Axe, and most of its route was occupied by the southern section of the Black Country Spine Road, completed in 1995. The line between Princes End and Ocker Hill closed to passenger trains in 1916 but remained open to goods traffic until 1981. The closure of the railway was followed by the construction of a pedestrian walkway on the trackbed, while the tunnel under the road at Ocker Hill was filled in. The final stub of the line, which linked Wednesbury with Ocker Hill Power Station, was closed in 1991. The Dudley-Wolverhampton railway closed in 1968, several years after passenger trains were withdrawn, and by the 1990s some sections of it had been built over, making it impossible to reopen this route at any stage. The former Tipton Five Ways railway station and Princes End and Coseley railway station were redeveloped for housing and road access. A bridge abundment that carried the line in and out of Tipton Five Ways another on the Birmingham New Road near the Black Country Museum are some of the last remaining signs of this railway in Tipton. Jack Holden (athlete) (1907–2004), a long distance runner for Tipton Harriers and Great Britain, running in both the Olympic and Commonwealth Games. A public garden was named after him in Tipton. William Perry (1819–1880), Victorian bareknuckle boxer and Champion of England. There is a statue of Perry in the Coronation Gardens, Tipton. Tipton Town football club were formed in 1948 as Ocker Hill United, adopting their current name in 1967. They currently play in the non-league West Midland league division one and made history in the 2010-11 football season by reaching the FA Cup first round proper for the first time in their history, earning a trip to Carlisle United, the League One (third highest English division) club. They were the first club that Steve Bull played for; he joined them on leaving school in 1981 and remained with them until he signed for West Bromwich Albion, a top division club, in 1985. However, it was after signing for Wolverhampton Wanderers in November 1986 that Bull achieved fame; by the time he retired in 1999, he had scored more than 300 goals for the club. He was also capped 13 times by the England national football team between May 1989 and October 1990, scoring four goals. The town has three secondary schools, though in the Tipton Green area of the town a significant percentage of children attend High Arcal School in the borough of Dudley. Ormiston Sandwell Academy, formed in September 2009 from Tividale High School, also takes in pupils from parts of Dudley and Oldbury. Until 1958 there was also a secondary school at Ocker Hill, which was then replaced by Willingsworth Secondary Modern School. Alexandra High School was formed in 1969 on a merger of Tipton Grammar School and Park Lane Boys and Girls Secondary Modern Schools, with the Park Lane buildings being retained until 1990 for the teaching of younger pupils at the new school. Tipton Green Junior School - on Park Lane West, Tipton Green. Started life in 1880 at a site on Sedgley Road West before relocating to Park Lane West in 1976, a new building opening in that building's grounds in 2011. Victoria Infant School - in Queen's Road, Tipton Green. Opened in 1995 to replace Manor Road Infant School, which was built in the 1930s. The current school exists on the site of the former Park Lane Secondary Modern School, which was later an annex for the younger pupils of Alexandra High School and Sixth Form Centre. Summerhill Primary School - on Central Avenue, Tibbington, on the merger of Locarno Primary School and Prince's End Primary School. Tividale Primary School - in Dudley Road West, Tividale. Great Bridge Primary School - in Mount Street, Great Bridge. Ocker Hill Infant and Nursery School  - located in Prospect Street, Ocker Hill. Ocker Hill Junior School - located in Gospel Oak Road, Ocker Hill. Glebefields Primary School - on the Glebefields Estate, Prince's End. Sacred Heart RC Primary School - in Victoria Road, Tipton Green and is Tipton's only Roman Catholic school. Wednesbury Oak Primary School - off Wednesbury Oak Road. It was constructed in 1972 to serve the recently built Wednesbury Oak housing estate. St Paul's Church of England Primary School - off Robert Road. It was formed in 1874 at a site in Wood Street. It remained at this site until 1992, when it relocated to a new building in nearby Robert Road. It takes its name from the parish church of St Paul, which opened in Owen Street in 1839. St Martin's Church of England Primary School - on Upper Church Lane. Joseph Turner Primary School - on Powis Avenue. Jubilee Park Primary School - on Highfield Road. Burnt Tree Primary School - on Hill Road. Tipton Christian Church was established around 70 years ago and today is a Pentecostal Church situated in Waterloo Street. Tipton Family Church was established in November 1992. It is an Evangelical Christian fellowship. St Matthew's Church Tipton is a Church of England Evangelical church on Dudley Road, established in 1890. St Marks Church Ocker Hill is a Church of England church in the Anglo-Catholic tradition. The British comedy film Anita and Me, set in the 1970s, was filmed in the area. ^ a b "Census 2011 Key Stats". Sandwell Trends. Sandwell Metropolitan Borough Council. Retrieved 2 July 2013. ^ Probably Tibba +ing + tun or Tibban + tun; Watts, Victor Ernest, ed. (2004). The Cambridge Dictionary of English Place-Names. Cambridge University Press. ISBN 9781107196896. ^ a b "tiptoncivicsociety.co.uk". tiptoncivicsociety.co.uk. Archived from the original on 15 September 2012. Retrieved 3 September 2013. ^ "Surname Database: Tipton Last Name Origin". The Internet Surname Database. ^ "More history beckons for Tipton". 4 November 2010 – via news.bbc.co.uk. ^ "Ocker Hill Infants and Nursery School". ^ "Tipton Christian Church". Tiptonchristiancentre.org.uk. Retrieved 3 September 2013. ^ "St Matthew's Church Tipton". Archived from the original on 18 December 2014. ^ "St Marks Church Ocker Hill". ^ "Friends Of Tividale Park". 2 May 2017.